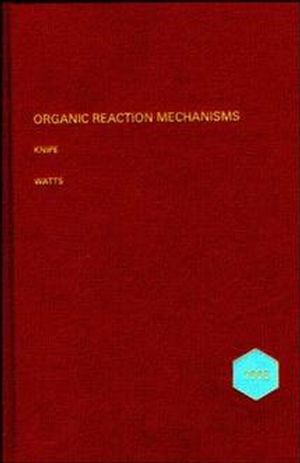 The only book series to summarize the latest progress on organic reaction mechanisms, Organic Reaction Mechanisms, 1995 surveys the development in understanding of the main classes of organic reaction mechanisms reported in the primary scientific literature in 1995. The 31st annual volume in this highly successful series highlights mechanisms of stereo-specific reactions. Reviews are compiled by a team of experienced editors and authors, allowing advanced undergraduates, graduate students, postdocs, and chemists to rely on the volume's continuing quality of selection and presentation. Reactions of Aldehydes and Ketones and their Derivatives (B. Murray). Radical Reactions Part 1 (A. Clark & S. Rooke). Radical Reactions Part 2 (I. Bilkis). Nucleophilic Aromatic Substitution (M. Crampton). Nucleophilic Aliphatic Substitution (J. Shorter). Carbanions and Electrophilic Aliphatic Substitution (A. Knipe). Addition Reactions: Polar Addition (P. Koovsk?). Addition Reactions: Cycloaddition (N. Dennis).